Are you searching for wood burning stoves and live in, or around Tadcaster? Driving to and from Tadcaster is excellent, as the A1 and M1 both pass nearby, while the A64 neatly joins Tadcaster to York and Leeds. Tadcaster (Roman name Calcaria) is a delightful market town surrounded by beautiful North Yorkshire countryside. With a fantastic array of cosy pubs selling fine ales and three historic breweries, including the oldest brewery in Yorkshire, it’s the perfect place to stop off for a relaxing afternoon. At our Leeds Stove Centre, we want to give our customers from the Tadcaster region the widest choice of wood burning stoves possible. We stock a massive range of designs and styles to suit all tastes, including modern, traditional and contemporary stoves. Our modern stoves offer the perfect focal point to any newly built home, apartment or other modern-style buildings. Not only do they offer a stunning focal point, but they also provide an exceptional heat output. We also stock a large range of more traditional styled wood-burning stoves that are perfect for cottages, farmhouses and older properties. Located close to Tadcaster, with easy access, we have a showroom offering live working displays of some of the wood burning stoves that we have to offer. This helps get an idea of how a stove would appear in your home. We also have a highly trained sales team that can answer any questions that you may have. Our aim is to provide you with the highest quality stoves possible at the very best prices, therefore we only supply stoves from the most trusted manufacturers. Some of the manufacturers that we supply include Stovax, Yeoman, Burley, Hunter and Dik Guerts. 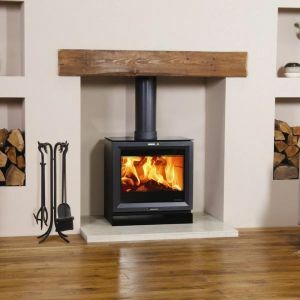 Having such a large selection of quality stove manufacturers allows a fantastic choice of styles, designs and finishes. We believe that you will not need to look any further for a stove. In addition to supplying stoves to Tadcaster, York, Wetherby, Harrogate, etc., we are also able to offer a full stove installation service. Our HETAS trained team of installers can professionally install your stove, flue system and fireplace, ensuring they are both at a high standard and in compliance to current building regulations. (You must ensure that your stove is installed by a recognised competent person who is appropriately qualified in the installation of stoves and that the installation complies with all local, national and European building regulations). Many wood burning stoves have a smoke control logo shown. This feature is important for homes in towns and cities as areas such as Tadcaster are Smoke Control Zones. If you are planning to install a solid fuel appliance within a smoke control area, you have to install a DEFRA Approved appliance. DEFRA Approved for use in a Smoke Control Area. If you do not have an exempt appliance, you might be limited as to the type of fuel you are allowed to burn. Our staff are more than happy to advise you on this issue. Please visit the DEFRA website for more information about smoke control areas. To arrange a FREE installation survey, or for any questions or queries, please don’t hesitate to contact us on 0113 255 5622.